MymT is a small prokaryotic copper metallothein discovered in Mycobacterium tuberculosis. It can bind up to 7 copper ions but has a preference for 4-6. This version has a C terminal sfGFP with a C terminal hexahistidine tag for purification. The MymT and sfGFP are separated by a short hydrophilic, flexible linker. A form of MymT was already in the registry at the start of our project (BBa_K190020) but it was not codon optimised to E. coli and we saw no evidence that it had been used. We codon optimised it and added a C terminal his tag in part (BBa_K1980002) and here added both a sfGFP and we obtained provisional data using fluorescence lifetime microscopy suggesting copper-binding in vivo. Should be able to bind multiple copper ions per peptide to increase the efficient use of cell resources. They should be from the prokaryotic domain because eukaryotic proteins can have expression issues in Escherichia coli. MymT is a small prokaryotic metallothein discovered in Mycobacterium tuberculosis by Gold et al.(1). It is believed that the protein may help the bacterium survive copper toxicity. Here MymT is encoded with a C terminal sfGFP, separated by a short linker (GlySerGlySerGlySer) to avoid misfolding, that has a C terminal histag for purification. We cloned MymTsfGFP from Gblock into the shipping vector then transferred it into the pBAD, arabinose-inducible commercial expression vector. We were unable however to detect copper chelation activity of MymT when expressed from pBAD in MG1655 E. coli strain, using an absorbance assay. We purified this part, from MG1655 cells expressign MymT sfrom pBad, suing Nickel affinity chromatography followed by dialysis. However were unable to detect copper chelation with the assay in our purified extracts when compared to a his-tagged GFP control. This is possibly because the flexible linked was susceptible to cleavage by proteases in the lysate meaning the protein we purified lacked the chelator portion. 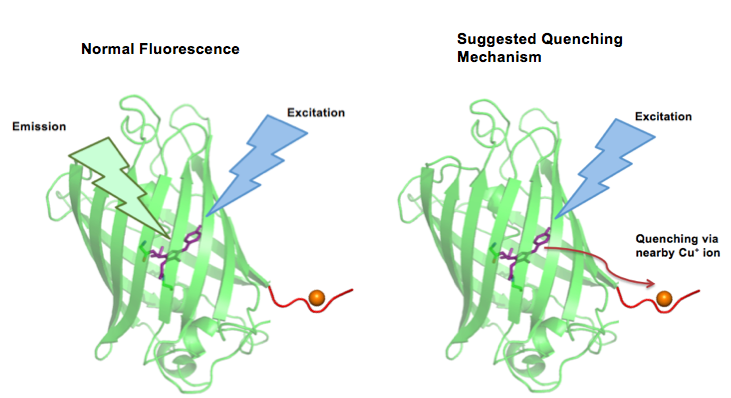 We discovered a paper by Hötzer et al(2) that described how His-tagged GFP can be quenched by a copper ion binding to this His tag leading to a reduction in the fluorescence lifetime (the time the fluorophore spends in the excited state before returning to the ground state by emitting a photon.) They speculated that this could potentially be used as a in vivo copper assay. Lacking access to a fluorescence lifetime microscope ourselves we contacted Cardiff iGEM who had a FLIM machine in their bioimaging unit. We sent Cardiff iGEM our parts MymTsfGFP in pBAD and pCopA CueR sfGFP (as a control) in live MG1655 E. coli in agar tubes. Cardiff grew them overnight in 5ml of LB with 5μM copper with and without 2mM arabinose. As expected the pCopA CueR sfGFP control was fluorescent, with and without arabinose, with the mean fluorescence lifetime a consistent 2.6ns. When MymTsfGFP was induced the mean lifetime decreased to 2.3ns. As MymTsfGFP is was observed to be reliably expressed and because MymT is a small copper cluster separated form sfGFP by a small linker we believe that this represents additional quenching of the fluorphore by MymT-bound copper showing in vivo copper chelation. (1) Ben Gold, Haiteng Deng, Ruslana Bryk, Diana Vargas, David Eliezer, Julia Roberts, Xiuju Jiang, & Carl Nathan (2009) “Identification of a Copper-Binding Metallothionein in Pathogenic Mycobacteria” Nat Chem Biol. 2008 October ; 4(10): 609–616. doi:10.1038/nchembio.109.